Unless you're a intrepid explorer for European hard rock or heavy metal, the Czech Republic's Seven will probably not show up on your radar. The band is the brainchild of guitarist Honza Kirk Behunek, a masterful and creative player. From a simple listen, it's obvious that the band and their latest offering Seven Deadly Of Sins is intended to be a showcase for his impressive fret work and song composition. Seven's music could be best identified anywhere in the spectrum from melodic hard rock (Midnight Circus, Lost Hero) to heavy metal (Gula, Master Of The Stage); often it is both: melodic heavy rock (Invidia, Acedia). Seven also attempts a basic, but extra heavy, rock ballad like on 'Web Of Obsession.' Some songs (The Magnificent Seven or Lost Hero, for example) are delivered at a quick pace that could near the speed of galloping power metal, but doesn't sound like it all. Equally interesting is how Seven can shift gears between intense and heavy melodic metal and melodic hard rock as when the move from 'The Magnificent Seven' to 'The Moon Lady Without Sin.' On every song, Behunek sizzles on guitar: his performances are creative and generally unpredictable. The second great star is the amazingly steady and precise rhythm section of drummer Lukas Kunes and bassist Petr Bidlo. You may have some difficulty with vocalist Jiri Komberec delivery as his native accent gets a bit thick on the English lyrics. Overall, however, Seven is a cohesive unit that delivers some very groove laden hard rocking tunes. Czech Republic's Seven and their latest work Seven Deadly Of Sins is a fine work of a guitar driven blend of melodic hard rock and heavy metal. The songs are well composed offering a premium blend of melody and heaviness. Seven Deadly Of Sins is a must find. Very recommended! 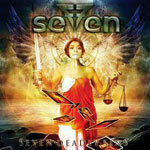 Czech Republic's Seven and their latest work Seven Deadly Of Sins is a fine work of a guitar driven blend of melodic hard rock and heavy metal. The songs are well composed offering a premium blend of melody and heaviness. Seven Deadly Of Sins is a must find.